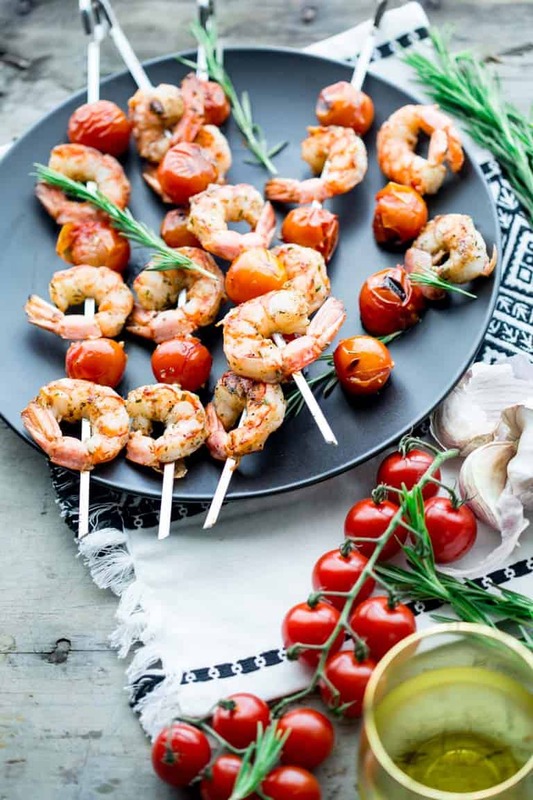 Nothing says summer like these rosemary shrimp and tomato kebabs. Fire up the grill and enjoy these savory, low carb skewers. And the clean up is quick and easy! Great for weeknights with your family. 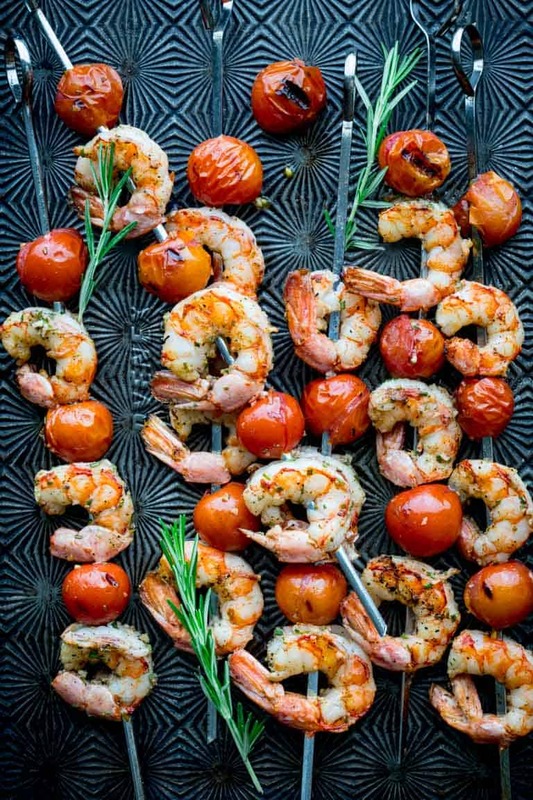 Indulge me while I write an acrostic poem about these Rosemary Shrimp and Tomato Kebabs. Yes, they have reduced me to waxing poetry. They are that good! Killer- these Shrimp Kebabs are killer because they pack a SERIOUS amount of flavor- like pow!! !- crammed into one simple marinade. Just mince up some garlic, chop a bit of rosemary, a splash of this a splash of that (sherry vinegar and olive oil) and toss in your shrimp. In less than a half an hour, these savory shrimp have taken on a lifetime’s worth of KILLER flavor! Easy- If you can chop and stir, then you can make this recipe. Just add your ingredients to a bowl, and stir them together. Let the marinade do the work. Then skewer away and you’re good to grill. Buttery- These shrimp taste ultra buttery when paired with the tangy sweetness of the grilled cherry tomatoes. Something about the combination of the two really hits the spot. I also love that cherry tomatoes and shrimp are perfect pairs on a kebab because they both cook so fast. Al Fresco- Nothing beats cooking and eating outdoors in the summer time. I love cooking on my charcoal grill, or gas grill if I don’t want to take the time to get the coals going. I love looking out at the view with the breeze while I tend the food on the grill. It never seems like a chore. Bright- The sherry vinegar adds a huge pop of acidity. Acidity is a secret weapon for adding flavor and balance to dishes without adding extra fat and calories. It’s often overlooked but so important! I love the use of sherry vinegar in particular here because it is Spanish and shrimp are a common ingredient in Spanish cooking. Because shrimp are naturally salty (they are from the sea after all) the acidity of the vinegar balances them- so the earthy rosemary and pungent garlic comes through. Savory- With kebabs this good all you have to do is break a hunk of artisan bread and toss a bowl of spinach with dressing and you have a savory meal fit for royalty! 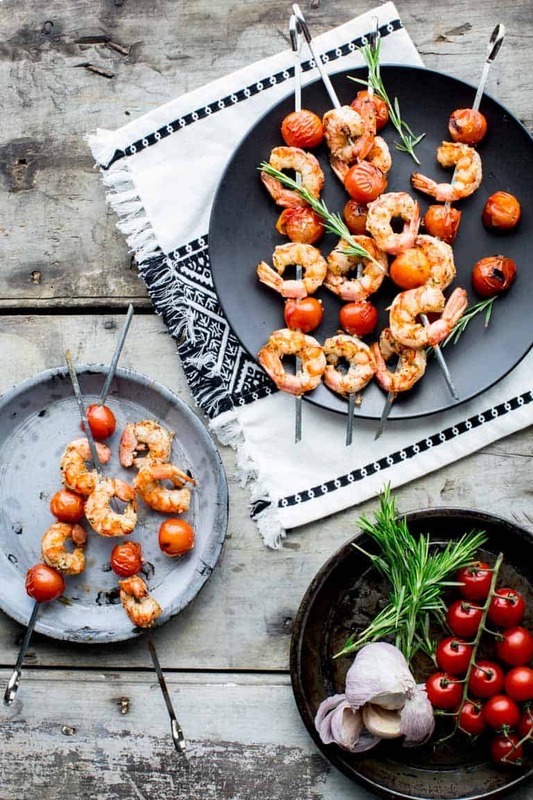 Nothing says summer like these rosemary shrimp and tomato kebabs. Fire up the grill this summer and enjoy these savory, buttery bites. Better yet, clean up is quick and easy! Great for weeknights with your family. Whisk garlic, oil, sherry vinegar, rosemary, salt and pepper in a large bowl. Add shrimp and tomatoes and toss to coat. Skewer shrimp and tomatoes onto 8 metal skewers, alternating so they will be divided evenly. Grill kebabs, turning once or twice, until the shrimp are just cooked through, 2 to 3 minutes per side, or 4 to 6 minutes total. Serve immediately. I love a good kebab, and this is a great flavor combo! Thanks so much Laura. I am glad you like the recipe. Enjoy the rest of the summer. I adore cherry tomatoes! Especially cooked over high heat! And with shrimp?! Yes, please! I can eat a whole pint of cherry tomatoes in one sitting myself. My favorites are the sun golds. They’re so sweet. 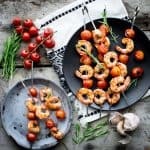 I love the idea of making a shrimp kebabs. Looks so delicious and perfect for BBQ hosting! In the spring I made some with asparagus. They cook fast enough to pair too. these look so addicting.! I would eat these kabobs everyday I just love shrimp! Shrimp can be addicting! I totally agree. I just pop ’em in my mouth! Ha ha. I am always looking for new shrimp recipes, thank you! I am glad this is a help for you. Enjoy! What a delicious and testy recipe thanks for sharing It looks gorgeous.